Each month the Anoka Knights of Columbus choose a family that models Christian family values and visibly live by them every day. The family chosen for May 2019 is the Kieffer Family. Jeff and Rhonda Kieffer have been parishioners of St. Stephen’s for 30 years. 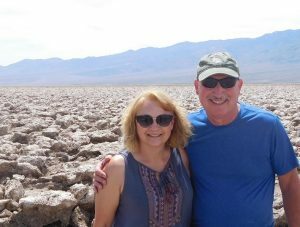 The Kieffers have been married for 40 years and have two adult sons that both attended St. Stephen’s school when they were younger. Corey now lives in Phonex, AZ and Aaron lives in Colorado. From the start of their membership at the parish, the Kieffers have been very active in the church and the Knights of Columbus. For the past 20 years, both Rhonda and Jeff have been volunteers with the Annual St. Stephen’s Lenten Fish Dinners with Jeff acting as chairman of this event much of the time, but as he points out, he gets a lot of help from Rhonda with this monumental task. Jeff and Rhonda have also been involved with St. Nicholas breakfast and Spring Breakfast over the past few years. For the past 5 years Jeff has been a member of the St. Stephen’s Pastoral Council and he has chaired the St. Stephen’s School Marathon and St. Stephen’s Mid-winter breakfast for many years. As a family, the Kieffers enjoy precious time spent with their Arizona and Colorado families whenever they can.